Bacteria are living things that are neither plants nor animals, but belong to a group all by themselves. They are very small--individually not more than one single cell--however there are normally millions of them together, for they can multiply really fast. See bacteria multiply in just a few hours in a 520 k time lapse movie. A simple and clear description about Bacteria is given.. Here's what the specialist says: Enter "Microbe World". Have fun browsing through that one! OK, one more: a Description of bacteria. A brief synopsis of the diverse world of bacteria, where you can learn that not all bacteria are harmful, is found in the Nature Bulletin. Another very informative site to visit is the Bacteria exhibit of the Museum of Paleontology, where you can also find a drawing and explanation of the inside of a typical bacteria. More details on bacterial structures are further explained in The New Microbial World, an introductory textbook for students of which the first 3 chapters are online. If you're curious what bacteria look like, check out our Special Feature Exhibit: Images of bacteria. A number of bacteria cause disease, these are called pathogenic bacteria. They are the subject of Medical Microbiology and the exhibit pathogens deals with them. A separate exhibit explains about bacteria and food safety. Fortunately our immunesystem knows how to deal with them. However not all bacteria are 'bad guys'. We need bacteria to stay alive, as is explained in our exhibit commensals. 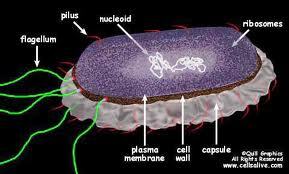 Bacteria are prokaryotes (single cells that do not contain a nucleus). It may seem weird to classify organisms according to such details, but having or not having a nucleus is not trivial at all. The division between prokaryotes and eukaryotes (all organisms with a nucleus inside their cells) is of extreme importance in biology, and is the result of a major evolutionary breakthrough. Visit our other exhibits if you want to know more about bacteria and evolution, or in what extreme environments bacteria can be found. 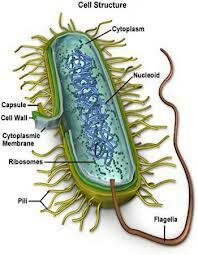 Microbiology is the study of prokaryotes, eukaryotes (as long as the organism is microscopically small) and viruses. What is the difference between bacteria and viruses?. Did you know that bacteria can be ill too? In our museum Bacteria are in the center of the picture, but there also are many other micro-organisms that can be useful to mankind or cause infectious diseases. Bacteriology is the study of bacteria.. Bacteria can be used for 1001 applications. That bacteria occpy a niche in teh ecosystem where they live is explained in our Special Feature Exhibit on microbial ecology.